Town House In Pissouri Village With Mountain And Sea Views. 'Annie's House' is situated only 20 minutes away from Paphos Airport. The house is a fully equipped family home. There is a large shared swimming pool which is located at the back of our house. The 2 bedrooms have air-conditioning which in the summer is a must, there is no extra charge for the air-conditioning. In the colder months of the year they can be used as warm air heaters. The villas living room has a log effect gas fire which is very effective. The 40" flat screen television receives internet TV and through FilmOn most UK and international stations can be viewed. Beach towels, sun beds and a hair drier are provided. Pissouri village has two banks, several shops and many tavernas. Guests can be met at Paphos or Larnaca airport and conveyed to the villa for a fee. Currently about Euro 45 for a Paphos pick up more from Larnaca. Hi, we are Mick & Anne; we bought our house in 2003 with the intention of moving in full time the following year. Retiring to Cyprus. Due to one UK commitment after another that move was delayed. Finally we were ready to make the move in early 2009, when the worldwide recession took its toll on UK house prices. So here we are with a foot in each camp. A home needs people in it, so we let our home in Cyprus out to caretakers who can enjoy its comforts, views and the life. As soon as the housing market picks up we will be in. Sorry. We first came to Cyprus to visit friends and after our first visit we bought their house from them. It seemed like a good idea as we were coming up for retirement. What’s not to like! Our home Annie's House is well situated near Paphos airport. Half way between Limassol and Paphos with the motorway close by. Fantastic views every day. Brilliant pool and a lovely village setting. The beach is just down the road. There is a bath with an overhead shower. UK type toilet and a washbasin. The solar panels provide plenty of hot water, but in the winter there is an immersion heater to boost the deficit. There is also an electric wall heater. In each bed room at no extra cost. The bedroom air con can blow hot as well as cold. The bath room has a convection heater. The living room has a log effect gas stove. There is a portable halogen heater to use where and as required. Please use it and only use liquid wash agent. A lovely log effect gas fire that heats the whole of the living room on a low setting. See notes on gas bottles! you get two then buy replacements if you need more! Plenty of bath and hand towels per guest and also a beach towel each. Up to 10 mbps. Works most things! Three Bioletti coffee makers a cappuccino frothier and a cafetiere. We have an Italian connection!. Four slice so no arguments. More than everything that you will need. It is our home from home. No Satellite or cable TV but there is internet TV from a 'box'. A good quality DVD player is provided and there is a good selection of DVD discs on the book shelf. The book shelf is quite full. Quite a selection of DVD's available on the book shelf. Quite large and with exceptional views of both sea and mountains. There is Aphrodite Golf course which is half the way to Paphos Airport. You can get a wheelchair to the downstairs bed rooms and bathroom but not up the stairs to the kitchen, living area. We have a large communal pool which is the pride of the development. Residents have a take it or leave it attitude to the pool and it seldom has many persons in it. We have four good sunbeds for use. Notes on accommodation: [Please note. Due to increased costs we have introduced a £25 SURCHARGE on each guest over TWO guests.This is per stay not per week] Sorry. Annie’s House Wi Fi: Annie’s House has inclusive Wi Fi which will work with lap tops, I pads, net books and I phones. Internet TV is available from many country's through Annie's House Wi Fi and its Android Box connection. Also a good DVD player. We provide for use of our guests a safe in which lap tops, i pads etc can be stored. Set your own access PIN. Cleaning / Towels / Linen: Towels and linen are provided for 4 guests with 1 change of bedding provided. Guests may launder their own bedding and towels during their stay if extra is needed. The villa is cleaned before arrival and after departure. Other: There is a small paved front garden which has potted plants. The small rear private courtyard can be used for sitting out in or hanging washing. Lovely location, well equipped and great value for money. 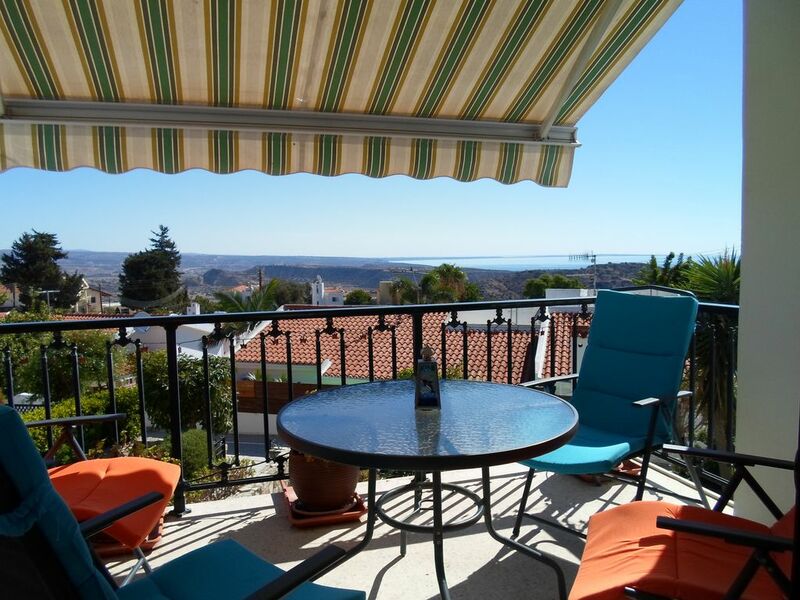 Very pleasant villa in a row of six with beautiful views of bay and coastline. Well appointed with everything you would need for a self catering holiday but as village a pleasant stroll away, bay a five/ten minute drive, both with a variety of lovely restaurants, no need to cook. Really nice to have lots of towels for both bath and beach and a change of bed linen if desired. Lots of storage space. Welcome pack was very useful as arrived much later than expected so the ham and bread and milk etc. came in very handy. Pool close by but we preferred the beach with bed chairs and the breeze. Very good value for money with all the added extras provided. This was our third stay at Annie's House and it was wonderful as always. Well equipped with free WiFi and amazing views. We'll be back! Stunning house to stay in! Annies house.. what a delightful place to stay! The house has two floors; the top floor has a kitchen, living room area, balcony. The bottom floor contains the bedrooms and a bathroom. This meant the bedrooms remained cool. Views from the balcony are glorious! You can see the coast, field over field of shrub and vineyard. The pictures don't really do it justice! The kitchen was stocked with everything if you want to cook or take a picnic somewhere. Pissouri Bay is a 5 min drive but the village centre is a very close on foot which hosts a variety of eateries and bars. Antonios kebabs were amazing! Home from home, comfortable, close to village, lovely views. Everything one would need for a relaxing break. Welcome pack, WiFi, TV, a/c hot/cold, pool, parking, mountain and sea views, quite location, but short stroll from village. Annie's House really is a home from home. It has nearly everything you would need. We like to come for a longer than usual stay. Annie's House is a home and is appointed as such. For those that want to cook in, the kitchen is more than fully equipped and the gas cooker and oven simple to use. The house comfortably sleeps four and there is plenty of room for everybody. It's sometimes nice to watch the large TV in the evenings. We bring our own movies but sometimes watch live UK programs on the telly. Probably the biggest plus for Annie's House are the views from the balcony. The development is residential and very quiet. The shared swimming pool is never crowded and always maintained to perfection. Pissouri Village is only a short walk from the house. This is the second time we have stayed at Annie's House and it was as perfect as the first time. The views are spectacular as always and the house is very well equipped. Free Wi-Fi and TV are a bonus. Pissouri beach boasts a blue flag and is approximately 3 miles from the house. It takes about 10 minutes to reach by car. It is possible to walk (about 1 hour) downhill, but it is harder to walk back. The beach is a popular tourist attraction with many shops and restaurants. The public beach although popular is never crowded and is safe for children. There are many water sports available at the bay. There is a free free car park and on street parking. Arrive at either Larnaca airport or Paphos. It takes about a hour and a half drive from Larnaca and 20 minutes from Paphos. Limassol and Paphos are about the same distance from Pissouri. It takes about half an hour to each place on the motorway that runs past Pissouri. A car is almost a must in Cyprus as there are few public bus services on the island. Driving is the same side as the UK and all the signs are in English. Pissouri village has nearly everything that you need for a holiday without a car. Language is not a problem in Cyprus as almost everyone speaks English. Booking Notes: A 25% deposit is required at once to confirm the booking. The balance is due at least six weeks before arrival. The payment is not refundable and it is recommended that travel insurance is taken out to cover any cancellation problems. Payment are by bank transfer in UK Pounds or through Ownersdirect / Home and Away. A £100 bond is also required which will be refunded after the villa has been checked over by Villa Minder and no damage, loss or misuse reported. Changeover Day: Unless by prior arrangement guests are expected to vacate the villa by 12 noon on the day of departure. The owners are very accommodating as to arrival days and departure times. Discounts may be arranged for long winter lets. Contact owners direct to discuss further. For each booking the log effect gas fire is provided with 2 x 10Kg full gas bottles. Any more gas to be purchased at guests expense.